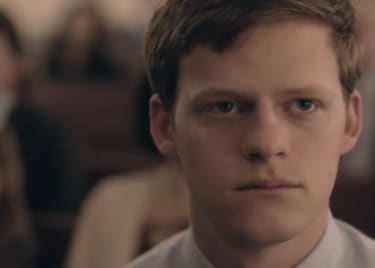 In a small town in Arkansas, Jared (Lucas Hedges) is a seemingly happy teen. He’s a talented athlete, dating a pretty cheerleader, and the son of a loving mother (Nicole Kidman) and Baptist preacher father (Russell Crowe). But inside, Jared is struggling with his sexuality. He’s been taught how he feels is unnatural, a sin. So, he hides his identity — until he’s outed to his parents at 19 and faced with an ultimatum: attend a gay conversion therapy program or be permanently exiled by his family, friends and faith. Based on the memoir by Garrard Conley, BOY ERASED is one of the most emotionally impactful films of the year that aims to educate people about the dangers of conversion therapy, which is still legal in 36 states. Joel Egerton wrote, directed and co-stars in the film as head therapist Victor Sykes, whose methods are more harmful than helpful. Hear more from Egerton and the stars in our exclusive interview. In the 12-day Refuge Program “to invite God back in,” Jared and his classmates are shown how real men stand, sit and shake hands. They’re not only verbally berated and humiliated, but also physically abused. None of this helps Jared stop his “homosexual thoughts,” and eventually he reaches his breaking point. 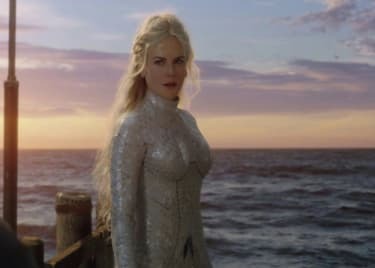 The film makes an intentional effort not to demonize religion, or the people involved, while also conveying the consequences of conversion therapy. Jared’s parents genuinely want the best for him, and he accepts their “help” because of his own beliefs, but none of them knew how traumatizing the experience would be. Lucas Hedges’ soft and sensitive demeanor works well for this role, and Nicole Kidman’s performance will bring you to tears. Russell Crowe and Joel Egerton deliver solid performances as well. 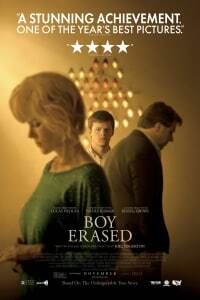 See the harrowing yet hopeful BOY ERASED in theatres. Get your tickets at AMC today.